Knee sprains and meniscal tears. Merck Manual for Health Care Professionals. Available at: http://www.merckmanuals.com/professional/injuries%5Fpoisoning/fractures%5Fdislocations%5Fand%5Fsprains/knee%5Fsprains%5Fand%5Fmeniscal%5Finjuries.html. Updated August 2017. Accessed March 27, 2018. Torn meniscus. Johns Hopkins Medicine website. Available at: http://www.hopkinsmedicine.org/healthlibrary/conditions/orthopaedic%5Fdisorders/torn%5Fmeniscus%5F85,P00945. Accessed March 27, 2018. 04/24/2014 DynaMed Plus Systematic Literature Surveillance. http://www.dynamed.com/topics/dmp~AN~T116776/Meniscus-tears: Snoeker BA, Bakker EW, et al. 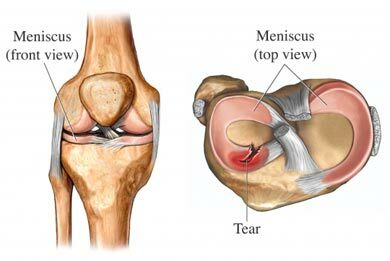 Risk factors for meniscal tears: a systematic review including meta-analysis. J Orthop Sports Phys Ther. 2013; 43(6):352-367.